DCU become a twitter sensation during storm Ophelia, after tweeting the Taoiseach to ask if they were a college. Leo Varadkar tweeted an update the night before Ophelia was to hit, to extend the red weather warning across the country, closing all schools and colleges as a result. 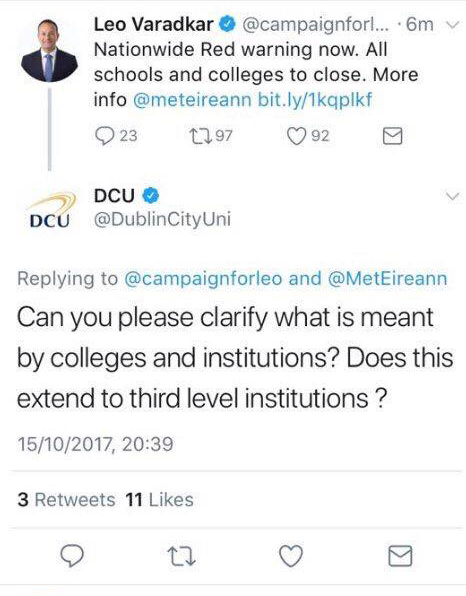 One of the many replies to the tweet was from the official DCU twitter page asking if the closure applied to third level institutions. “Can you please clarify what is meant by colleges and institutions? Does this extend to third level institutions?” @DublinCityUni tweeted. The tweet was promptly deleted but had already been screenshot by a number of twitter users who proceed to share DCU’s reply. “DCU may have deleted the tweet but we will never forget that they asked the Taoiseach if we are a college,” @winslowthe7th tweeted. “Some of us are waiting for to hear if we have to go to work tomorrow. But DCU are having an existential crisis,” @lucyoshea tweeted. While the person behind the tweet has chosen to stay anonymous, according to Chair of the MA in Social Media Communications, Dr Eugenia Siapera, these kinds of slip ups on Twitter are not uncommon due to the urgency of social media. “In the fast paced cycle of social media communication, mistakes, faux pas and gaffes are inevitable. People may also have noticed that both #Opheila and #Opehlia were trending but #Ophelia was nowhere to be seen. So perhaps what really matters is not so much the mistake but bouncing back from it,” she said. Dr Siapera commended DCU on their comeback the following morning. “I think this ‘controversy’ is totally within the logic and scope of social media communications. I also think that DCU’s recovery was great,” Dr Siapera said.